Despite being classed as one of the driest states in the US and well known for its deserts, the state of Nevada does still have a few lakes for residents and travelers do enjoy. Lake Mead, which is situated just a little outside the famous city of Las Vegas and straddles the border between Nevada and Arizona, is actually one of the biggest reservoirs in the entire US in terms of how much water it can actually hold. This man-made lake was formed with the creation of the Hoover Dam and provides water to Nevada, as well as Arizona and California, and even parts of Mexico. It runs for 112 miles in length, holds up to 26 million-acre feet of water, and is located on the famous Colorado River. Named after politician and engineer Elwood Mead, the lake is split up into several basins and bodies of water and surrounded by mountain ranges and desert landscapes, with long-distance views and stunning scenery in every direction. 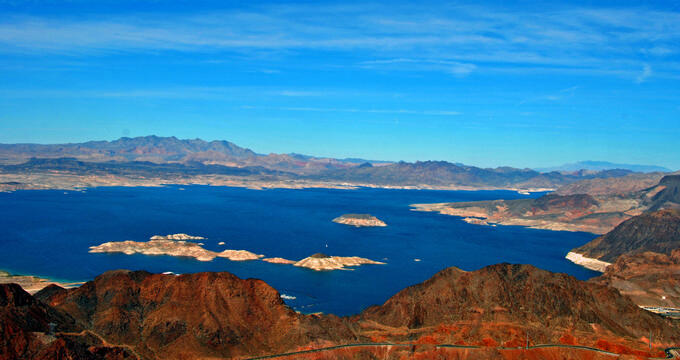 As one of the main and only major bodies of water in the area, Lake Mead is a highly popular recreational spot for Las Vegas locals and other nearby residents and tourists. Boating, fishing, kayaking, swimming and other water-based activities can be enjoyed on the lake, which boasts four separate marinas and hosts several fishing tournaments. Kayaking is a great activity to enjoy on Lake Mead, with many coves and areas to explore and various rental and kayaking tour opportunities to try out. Many different kayaking companies operate both around Lake Mead and in nearby Las Vegas, offering kayak rentals, guided tours, and other kayak-related services for visitors to the lake. If you want to have the very best kayaking experience on Lake Mead, it’s a smart idea to get in touch with one or more of the following companies. They’ll be able to provide the kayaking equipment and advice you need to see the best spots on the lake and have a great time. Focusing on both Lake Mead and the Black Canyon, Desert Adventures offers a fantastic selection of Colorado River kayaking trips that take in all of the major sights, as well as a few little-known spots around Lake Mead too. Half and full-day trips are available, as well as multi-day trips for serious kayakers. The half-day Lake Mead trip is a great way to start, taking in the Boulder Islands and giving guests a great chance to learn more about the history of the lake and Hoover Dam too. The tour features around three hours of paddling and is suitable for beginners, especially when the conditions are good and the winds are calm. If you're staying in Las Vegas and need a kayaking tour of Lake Mead that offers convenience travel to and from the city, this is the one to pick. Awesome Adventures runs a wide array of outdoor activities in the Vegas area, including this superb guided kayaking tour of Lake Mead including a picnic lunch and even a stop-off at the Boulder Islands for a brief hike or rest on the beautiful beaches. The full tour lasts six to seven hours and is fully suitable for inexperienced and younger kayakers. A professional guide will lead the way and the full experience also includes pick-up at your Las Vegas Strip hotel and travel back afterwards. Headed up by seasoned kayaking expert Robert Finlay, Kayak Lake Mead offers a range of kayaking tours and lessons. The most popular guided kayaking tours with this company take in Emerald Cave, the Arizona Hot Springs, and the Temple Basin. The simplest trip is the family-friend Emerald Cave trip, offering stunning views of one of the lake's most gorgeous locations, while the 6-8 mile Temple trip and 16-mile hot springs tour are more-suited to experienced kayakers looking for a full day of action. Throughout all of these trips, one of the best Lake Mead kayaking guides in the world will share his experience and knowledge with the group, guiding them to the best spots and regaling them with exciting and educational stories about his own time on the waters. If you want an authentic Lake Mead kayaking experience, Robert Finlay is the man to choose.